The title covers it..12 guage Mossberg bullpup. Orignal factory model not a kit build. In good shape no rust or pitting. See pics. The perfect home defense shotgun ..18" barrel easy to wheel around in tight spaces. The handle on the top can be removed for a cleaner look, see the pics. Mossberg/Maverick Arms 12ga Bullpup shotgun. When was the last time you saw one of these?? 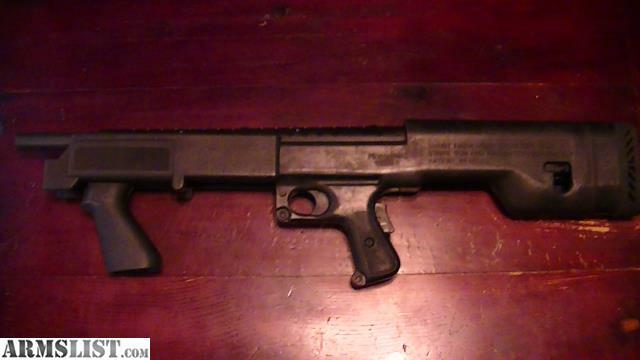 This shotgun was factory-built as a Bullpup, unlike many of the DIY kits that were sold later. The Mossberg 500 family of shotguns is perhaps one of the most popular and versatile American-made pump-action shotguns ever produced. Mossberg 500’s were made with a wide assortment of barrel and magazine lengths, finishes, stock shapes and accessories. From 1981–1995, about 15,000-25,000 of these variants were manufactured by Mossberg and their subsidiary company, Maverick. This particular variant is set up in the “bullpup” fashion, with the feed and fire mechanisms located behind the grip and trigger. Generally, the bullpup designs are known for a more comfortable distribution of the gun's weight for the user. This Mossberg 500 is chambered for 12 gauge shells (which are magazine fed) and a manually operated (pump-action) smoothbore gun. This is the same style Bullpup shotgun that was used in several movies (RoboCop, Predator 2, The Original Stargate movie, Twins, The Hidden, The Running Man, Stone Cold, Rapid Fire, Point of No Return, Bulletproof and Crank.